Does it get any better then a batch of homemade chocolate chip cookies? Me thinks not. My little sweet smelling our freshly baked sweets! It has been far too long! My apologies. I need to get this blog up and running...the problem with this is that I am not creative. I had some lovely pictures to post of my kitchen, 'then' and 'now' since we painted the walls and the cabinets...but, then my computer took a nose dive and those pictures are no longer to be had. A sad day indeed. So, I'm coming to YOU...what do YOU want to see here, or better yet...contribute?! Please, don't be shy. Hi there...and Welcome to "Delightfully Domestic Dames". I'm glad you could stop on by. 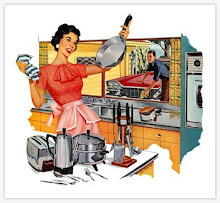 This blog is designed for any woman who thinks that the 50's housewife is a modern day hero, like I do. This is a woman who happily arose in the morning ready to prepare a wonderful breakfast for her husband and children, and did so in a lovely skirt, pearls and high heels. This is a woman whose house was always kept up, meals were always hot, and she was always so fashionable, presentable and ladylike. Family values were always number one and never ever forgotten. It is very difficult to find that in many homes today. But also, there is much Heaven on Earth that should not be over looked...a true blessing. I am not a perfect wife, my home is not in ship-shape order, I am not super organized and the list goes on...but I want to be all of that and am doing all that I can do to be all that I can be. I suppose that sounds like a House Wife motto. I know that there are many women out there, both new wives as well as seasoned, and we all have our individual challenges. I want to welcome any women, married or not, to partake in this blog. Share ideas, recipes, stories, projects, vent if you need to or anything else that should pop into your mind. I chose the 50's Housewife theme for my blog because I truly admire those ladies. Although my Mom wasn't a 50's era wife...she was indeed a 50's style Mom...home cooked meals, warm chocolate chip cookies after school, doting wife, and happy Mother who put up with precisely zero nonsense...exactly the type of Wife and Mother I strive to be daily. You are probably already that woman, and I genuinely applaud you, so if you are striving to be a proper 50's housewife or want to be even greater then you already are, I invite you to jump in and join me, we'll learn and grow together. Shine your pearls, get out your skirts, dawn your aprons...here we go, ladies!